Original text and images of the 1987 Schwinn sales brochure. On the Cover: The start of the final stage of the Coors International Cycling Classic. At major bicycle races you undoubtedly will see several relazed, confident cyclists wearing the Schwinn jersey. Typically they don't have much to say, but their impressive list of victories makes their words invaluable to Schwinn engineers. You see, not only do they race - and win - they are constantly testing Schwinn engineering advancements. And, it's the team's demanding requirements that are first met before innovations are incorporated into the model line. It's a tough rule to live by, but we simply don't see how to build a Schwinn any other way. Innovators, a lot of people talk about them and an even greater number claim the title. Schwinn, however, is one of the few that can honestly say that we have consistently improved the technological aspects of cycling. Presently Schwinn engineers are working extensively with new materials and techniques developed for the aerospace industry to determine their practicality and reliability for cycling. Our engineers use computers to aid design and evaluate this technology. We continously work with our component supplers to enhance the performance and reliability of the entire bicycle. It takes painstaking experimentation and analysis, but this extra effort is what makes Schwinn the innovator: From the very beginning, our network of Authorized Schwinn Dealers have been a cornerstone of our business. The colours of World Class status are proudly displayed on our finest effort... the Paramount Frame. These coveted colours mark racing's highest level of excellence, worn by only a chosen few who've performed better than the best. Unmatched in the industry. Authorized Schwinn Dealers provide a unique approach to servicing the customer. We focus on delivering the right bicycle for your needs. We back each sale with parts and service for proper care and maintenance to keep you on the road. The Schwinn No Time-Limit Warranty* insures quality materials and workmanship. Best of all there's a nationwide network of Authorized Schwinn Dealers ready to serve you. These innovations make a bicycle very special. It takes a special person to appreciated a Paramount. It takes a unique undersdtanding to know the importance of matched Columbus tubing, precise engineering and immaculate brazing, clean elegant lines, and perfect finish. What's more, it takes a special person to ride a Paramount, to delight in its perfect road manners, rigidity and lightness. If you're a special person; if you would rather not suffer that shortcomings of mass production, you clearly deserve nothing less than our best. You deserve a Paramount. Paramount available in Road and Track Models, in 13 frame sizes and 6 colors. Paramount cycling apparel makes riding more efficient. Fashionable. More fun! Our complete line of clothing offers good looks all year 'round. Like jerseys, Shorts. One-piece tri-suits. They hug your body for a sleek aerodynamic fit. BEst of all, our comfortable innovative fabrics are as easy to maintain as they are to wear! Styles and fashions may vary. See your Authorized Schwinn Dealer for current selections. The Paramount Cycle Computer eliminates guess work. You ride smart with six fuctions at the touch of a button: speed, maximum speed, trip distance, odometer, stop watch, plus a 24-hour clock. Monito your performance without taking your hands from the bars. Ergonomically designed. Exeptionally small and lightweight. Fits virtually all bicycles makes and models. Start your rider with our lightweight, Paramount Cycle Helmet. It's sleek, aerodynamic shell buts the wind while its ventilated construction keeps you cool. Fits secure with a quick-release retention strap; absorbent brow pads remove for easy care. Two sizes with adjustable fit pads, in black, white, red, yellow and blue. Meets ANSI Z290.4 safety standards. The Circuit and Super Sport are designed to meet the unique demands of the more serious cyclist. A special blend of Columbus SL/SP tubing, and aero fork and stays make the circuit ideal for high level competition. The Super Sport's indexed shifting and aerodynamic components give the tri-athlete that added advantage. Performance designed Schwinn clothing makes riding more comfortable and efficient. Add a cycling computer to monitor your training and you'll become more than a force to reckon with, you'll be the force to follow. The Circuit are designed to meet the unique demands of the more serious cyclist. "Road a feel, responsiveness and rigidity" are terms most often used when talking about fine bicycles. These terms effectively describe the Schwinn Tempo and Prelude: each loaded with all the right component try for high performance. Mix and match Paramount nylon-mesh toe straps, available in spectrum of colors. They won't stretch like conventional leather toe straps. Lightweight Sidi shoes add a final element for the maximym transmission of power. If value matters, and so does the bike, Tempo and Prelude are two models to ride like you've never ridden before. Shimano's new 105 low profile Biopace crankset, aero pedals with unbreakable resin toe clips and braided nylon straps. Sidi Revolution - outstanding quick release design. Ideal for the triathlete. Reinforced nylon sole with a combination nylon and leather upper. Features two secure hook and loop closure tabs for comfort and fit. Sidi Cycle Titanium - the ultimate in comfort and quality craftsmanship. Made of a supple Kangaroo skin upper with a leather inner and outer sole. This shoes fits like a glove. Strap yourself in with colorful Paramount toe straps. Incredibly strong nylon-mesh straps won't stretch like conventional leather. Paramount straps stay tight and keep your feet securely on the pedals, where they belong. Powerful chrome quick-release buckle allows easy exit. Complement frame with six colors: pink, yellow, red, blue and white. The Schwinn LeTour and Traveler provide exercise you look forward to. Invigurating, exhilarating, stimulating ... a ride on a LeTour or Traveler is an enjoyable workout that makes you smile. Riding is more than just good exercise. It's a great way to spend an afternoon in town, or a weekend away! Personalize your Schwinn using bright Benotto handlebar tape, available in a variety of colors and textures. And keep a steady grip with our lycra gloves. Available in five great colors. Wrap up in style with Benotto handlebar tape. Ten great colors to complement any frame. In stripes and solids. Paramount clothing: functional and fashionable. This great - fitting jersey features a tapered drop collar. Bias cut waist. Available in a variety of innovative fabrics. Attractive styles and colors to choose from. Paramount lycra tights keep you warm on cool, crisp days. Anatomically cut with stirrups underfoot. Elastic waistband for ultimate comfort. Sized for men and women. In many bold colors. Paramount lycra gloved are specially designed to keep the pressure off while you put the pressure on. Washable synthetic palm. Stretch lycra top. Terry-towel thumb. In black, white, red, pink, or teal for style and performance, hands down. Schwinn's reputation for quality and value is its hallmark. The 1987 World, World Sport and Sprint examplify this tradition. These strong, street tested bikes are meant to be ridden every day. Featuring durable steel wheels on the Sprint, quick-release front hub on the World, and a chrome-moly frame on the World Sport. For stylish, value-packed transportation, they get you where you gotta' go and they do it the Schwinn way! Front alloy quick release with alloy rims. Look closely at the pedal action of some of the fastest cyclists in the world. Their spin is so smooth, so natural, it appears to be nearly effortless. The way these superstars developed this efficient style is by spending hours training on a fixed gear to make their perfect spin second nature. Use the versatile Madison's fixed gear for indoor training, spring workouts, and track riding. Flip the hub to the free-wheel side, stick a water bottle in a cage, and with the include side-pull brakes, you're readto to hit the road. If the thought of riding down your driveway and not coming back has often crossed your mind, think for a minute about the Voyageur. Full braze-ons for multiple racks and bottles, cantilever brakes, 40-spoke rear wheel... all Schwinn quality. It's hard to find a better way to go. With a full set of color-coordinated Voyageur packs, ride it for a weekend, a week, a month, or a year. Add a rack or basket. Accessorize to suit your personality. The World Tourist and Collegiate are perfect companions for springtime picnics. Summer beaches and Autumn jaunts. Wheels with style that deliver smile after smile! Keep cool in the heat of it all with Schwinn water bottles. Two thirst-quenching sizes: 22 oz standard capacity and 30 oz large capacity. Each available in white, red, blue, yellow and clear. Match them with Paramount alloy bottle cages. Extra lightweight. Incredibly stron. In red, blue, yellow, pink, white and black. 5.0mm and 6.0mm size for added strength when touring or mountain riding. The Voyageur Survival Wedge makes road-side repair a breeze! Our popular wedge-shaped bag fits snugly under the saddle. Houses one of the finest tool sets on the market. Inside pockets and tough elastic loops strap in all you need to keep on rolling: 8, 9, and 10mm sockets; 4,5 and 6mm allen bits; two screwdriver bits; a socket adapter; a T-handle. Roomy enough for tire levers, a spare tube and a patch kit, too! No matter what your load, Schwinn has a Voyageur lightweight alloy carrier for your. Choose from many fromt and rear-mounted models with six-beam support. All exceptionally durable and good looking. Schwinn and Schwinn-Approved bicycles, excercisers, parts, accessories and other products are warranted to be free from defects in materials and workmanship... no time limit. Notice: The user assumes the rish of any personal injuries, damage to or failure of the bicycle and any other losses if Schwinn bicycles are used in any competitive event, include bicycle racing, or bicycle motorcross, dirt biking or similar activities. DO NOT USE Schwinn bicycles for stunt riding, ramp jumping, aerobatics or similar activities, or with motors as power driven vehicles. This warranty does not cover any personal injuries, damage to or failure of the bicycle, exerciser, or other product, or other losses, due to accident, misuse, neglect, abuse, normal wear, improper assembly or improper maintenance. 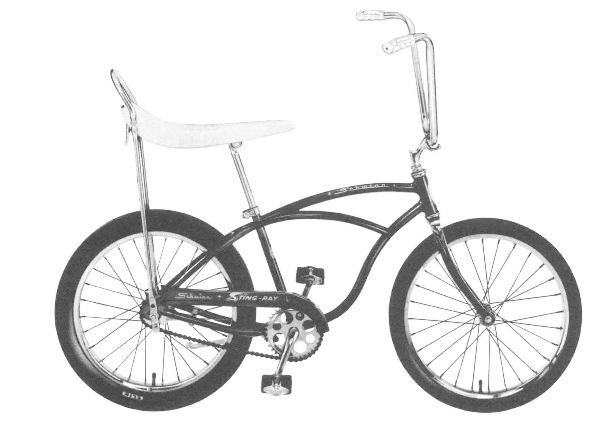 Each Schwinn bicycle and exerciser will be full assembled bu the Authorized Schwinn Dealer at the time of purchase. Each Schwinn bicycle will be entitled to receive a Free 30-day checkup bu the same Authorized Schwinn Dealer of operation... such checkup to include free replacement but not including any repair due to accident, improper use, neglect, abuse, normal wear, improper assembly or improper maintenance. At its option, Schwinn will.. without charge..either provide a replacement of or repair any Schwinn or Schwinn-Approved part or accessory which is defective under the terms of this warranty - Dealer labor charges in installing replacement part or accessories are not covered by this warranty, except for bicycles during the free 30-day check up and except for any labor charges due to replacement of a defective frame for bicycles or exercisers within one year of original purchase at retail. Repair or replacement of defective parts or accessories and those dealer charges specified above shall be the sole remedy under this warranty, and in no event shall Schwinn be liable for incidental or consequential damages; Some states do not allow the exclusion or limitation of incidental or consequential damages, so the above limitation or exclusion may not apply to you. This warranty gives you specific legal rights, and you may also have other rights which may vary from state to state. See your Authorized Schwinn Dealer for service or replacement under the Schwinn Limited Warranty or write to the Consumer Relations Department at Schwinn. This is the Schwinn catalog for 1987.